I have a riddle for you. What do you get when you cross a love for old stuff, countless hours spent watching HGTV, my wife, and a desire to create multiple income streams? I’ll give you a moment to consider. Have you figured it out yet? Here’s the answer: my latest side hustle! 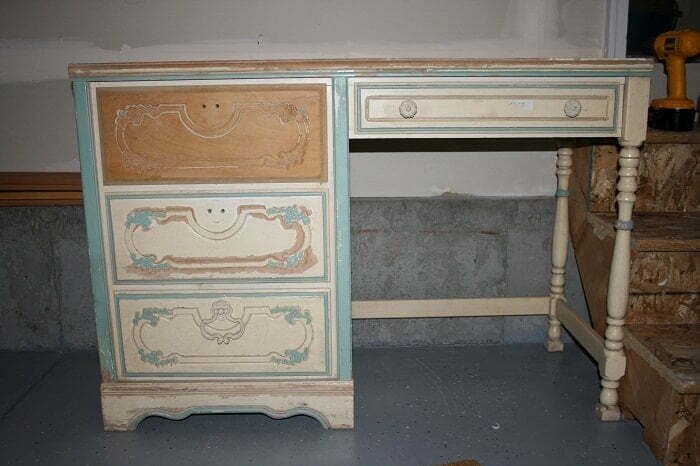 A child’s desk, purchased on Craigslist for $35. Lately I have been OBSESSED with purchasing furniture. 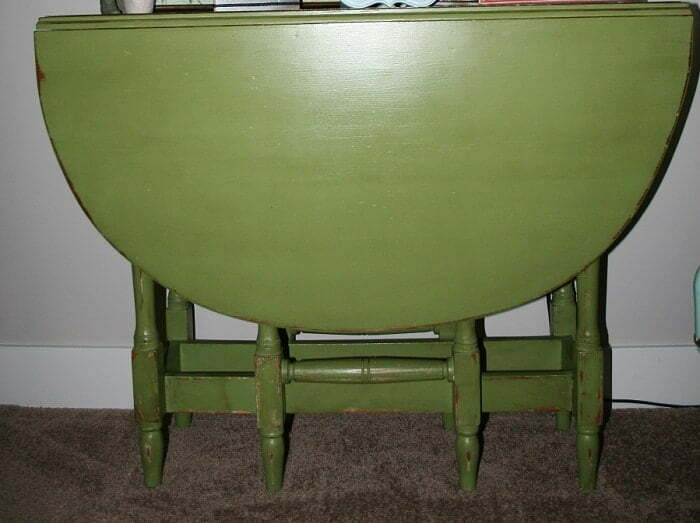 I look for this furniture everywhere: at yard sales, antique shops, online, even on the side of the road. I only have a few requirements for the furniture. It must be solid wood, in good enough condition that it can be restored, and above all, the price must be right (much like real estate, the money is made in the purchase price). Once I purchase the furniture, the real magic takes place. That magic comes in the form of my wife, Tiffany. 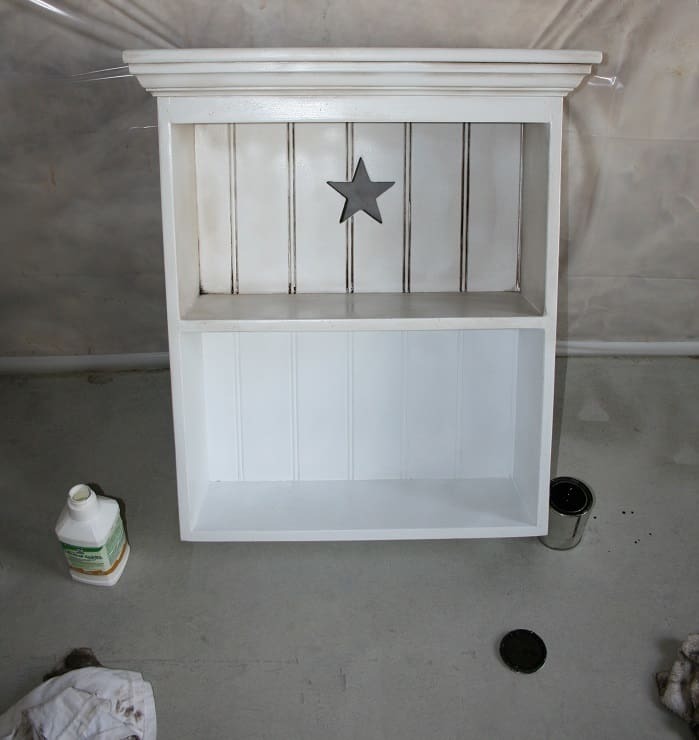 Tiffany has been honing her skills as a finish painter for as long as she can remember. Recently, she has added woodworking skills to her bag of tricks. My penchant for haggling and scouting out good furniture, combined with her array of finishing and reconstruction skills has created our favorite new side hustle: refinishing furniture. A shelf at the midway point. Top half has been painted and stained, bottom half has not yet. I may have scared you off a bit with the talk of my wife’s serious skills. While it is true that she is extremely talented, talent is not really a prerequisite for this side hustle. All you truly need is a desire to hunt out items that others have given up on, and the discipline to put some time into refinishing the item. 1. Find an item and purchase it for as little as possible. 2. Rough up the surface of the wood with a palm sander. 3. Throw on a coat of paint. 4. Sand off the paint in a few spots. 5. Stain or glaze the spots that you sanded. 6. Apply a coat of Polycrylic clear coat spray. 7. List the item on Craigslist or a similar site. Finished table – purchased for $25, asking $125 on Craigslist. The style that we strive for with each of our items is sort of “Country Rustic”, which is a very popular look where we live. If you finish your item in a different style, some of the steps may be different or not required. Spend some time getting a feel for the style that sells well in your area and start honing your skills to finish that style. Remember, people are going to pay for your stuff because it matches their style, but they don’t have the time or knowledge to do it themselves. Don’t worry, I haven’t forgotten the main reason most of us spend time on side hustles: income. Like any side hustle, income from refinishing furniture is highly variable. There are a lot of factors involved including purchase price of the original piece of furniture, refinishing skill/style, availability of similar items in your market, time spent on the side hustle, and many other factors. In general, you should be able to make a pretty good return on your money. We typically buy items for less than $50 and sell them for $100 or more. When we are focused we can do this several times per month. You probably won’t be able to replace your full-time income with this side hustle, but if you are diligent you can make a nice chunk of change. As an added bonus, refinishing furniture can be really fun! 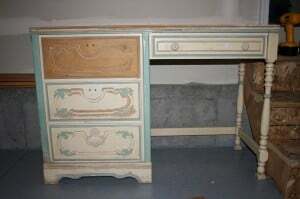 So the next time you see a piece of old furniture don’t think of it as a piece of junk, think of it as a possible investment! This guest post was written by Nick. Nick is a recent college graduate trying to find his way in the crazy corporate world. He is a happy husband, a proud father, enjoying life in Utah. You can connect with Nick on Twitter. Incredibly done! What a great (and rewarding) side hustle, for sure. You do great work. This is something I’ve considered. I’m both crafty and handy. I hesitate because of time, something I currently lack. Having said that I may still give it a go! Oh no! My heart breaks for the beautiful solid wood that is being buried under layers of paint! We have several pieces that we’ve acquired on the cheap over the years and have stripped, sanded, stained, and varnished into things of beauty. And several more that are in various stages of incompletion along the way. =). Great side hustle, but I don’t think I’d want to paint beautiful old wood! What if it’s American chestnut under there? Mrs PoP @ Planting Our Pennies recently posted…He Said She Said – The Banana Thief! I love this article! I’m really into vintage, and antique pieces. I have a collection that’s large enough to furnish a massive family home (but moving into a 500sq ft train car), so I spend a chunk on storage. However in response to the wood lovers, something about the research involved in flipping furniture is the education gained. I guarantee Nick and his talented wife know more about types, periods, and design than the average. If they found a true hepplewhite, I am sure they’d restore it. On the other hand some pieces, especially those with veneers, are salvaged, recycled, and saved from the landfill by them painting it. Kudos to them on making extra cash recycling! Wish I could meet Nick and his wife to shake hands, and say thank you for giving new life to pieces that might have ended up in a landfill (: Blessings, and prosperity to you both! I really like how you and your wife work together on this! The bookshelf is really cute. This is definitely something I’ve been interested in, but I have to agree with Mrs. Pop. Both my dad and my boyfriend love the look of wood, so I don’t think they’d be letting me paint anything. My dad has a shop set up in the garage and just recently refinished the coffee table they’ve had ever since I can remember! My mom said it turned out lovely. If I am able to move closer to them I’d love to work on things with my dad and see what we can make happen, though it’s primarily a hobby for him, not something he thinks of as a side hustle. Alicia @ Financial Diffraction recently posted…being a wedding guest is expensive. 1500! I would certainly flip furniture except my nails, my precious Nancy Nails that I use to create gorgeous, milky tones on the classical guitar. Surely, I’d lose a digit or two on my very first project and cry on my 6 strings forever more…. cj recently posted…Who’s Afraid of the Urgent Doc? Micro recently posted…Would you move to find work? This is a side hustle that I can dig, the end product is so cool! The problem I would have is letting it go when I’m done! Nice job. Can you please tell us how many hours (in average) you spend on single peace of furniture? I love this side hustle…making old things new. How cool. Do you have any tips on picking up paint, (e.g. – from the oops table at Home Depot) or do you pick out cans specifically for a piece of furniture? Thanks for demonstrating that flipping furniture is a real way for regular peeps to make some extra money with time and dedication – thanks for sharing your experience, well done and much continued success to you! Thanks for the post! This is a side hussle for me and am loving it. I primarily work with chalk paints although it is costly. Will by jumping in to making my own soon. My question to you Nick is other than Craig’s List as you mentioned, where are you getting success in selling your items? I’m starting to build local clientele on Facebook but am looking for other avenues. Have you tried the swip swap pages on Facebook for your area? Me and a fellow stay at home mom do this to earn some extra money. These groups seem to yield the most responses for us. I just refinished my first piece of furniture with chalk paint, my own 30 year old dresser. It turned out great, and I am hooked! I don’t know if I can make money as a side hustle (although I would love to), but at least it will be a fun hobby. 1500, Its great to hear about this sideline, and anyone can really do it. I personally am taking it a step farther, and opening a shop where I live, as the market is fabulous here, and it really is a sideline in a way for the other things I sell in the shop. Nice, that sounds like a fun gig! Best of luck in the venture! Hey there, I found two fairly large unique chairs yesterday for $8.00 each and they were solid wood with an upholstered seat. I would need to upholster it and paint it. My question is if its worth buying to flip for a profit? and how do you figure out pricing? You know, $8 is a good deal if the chairs are study and appealing. Solid wood is hard to come by in the age of Ikea. If I were you, I’d go for it. It shouldn’t cost much time or money to come up with some paint and fabric. If you don’t already have paint, check the “Ooops” paint section at Home Depot. They sell returns for a fraction of what they would cost normally. As far as pricing, I’d throw them on Craiglist after doing a bit of research. There are CL search engines like this: http://www.searchtempest.com/ Remember to price a little high because people will always want to bargain with you. 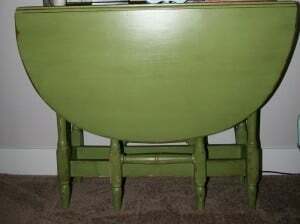 Do you sell your finished furniture pieces anywhere besides Craigslist? Etsy? A local high-end consignment? I’ve just started this myself. I’m 46 but maybe by the time I retire I’ll have enough skills to be able to make a little extra cash and keep myself busy at the same time. Best of luck! Seems like a great thing to pursue in retirement! I am working on my first dresser for my babies room. It’s turning out really nice so I’m thinking about doing some flipping myself. I am wondering if you have a suggestion for where to get new guide rails for drawers? Do you have an Ikea near you? I’ve noticed that they have a huge “scratch and dent” section with loads of random parts. If neither of those work for you, I’d call a local woodworking store. I realize I’m late to arrive on this article but one of the first things that caught my attention was the reference to how much was spent on an item and the expected return. I typically shop on Craigslist (I don’t have the patience to drive all over town looking at garage sales that may or may not have furniture) and look at everything under $50. I look for shapes that mimic something I’ve seen finished already but also stumble on things that just have an interesting look overall. The difference is in my selling price. I have repeatedly sold items for between $150-$400 that I’ve picked up for between $25-$50. I’d love to leave my website here but at the same time, I don’t want potential buyers knowing what my margin is. Mind you, making $300 on a $50 investment isn’t all gravy; it’s hard work! I don’t just slap paint on or stretch new fabric over old dirty fabric. I strip everything down to the bare bones and rebuild. So in a sense, my customer is getting a new product. Also – be patient when you’re selling. Do not settle for a low-ball offer because you think that’s all it’s worth. You’ve put a lot of work and creativity into your pieces and finding the right buyer can take time; sometimes several months! It’s not all about a quick sale if you want to really make money ‘flipping’ furniture (I avoid calling myself a flipper because of the work I put into my furniture). I’ve been doing this part time for a couple of years but because of recent employment changes, might be taking the plunge into making this a full time career. Time is the most valuable asset we all have! Your elbow grease and knowledge is what folks are really paying for and not the initial cost of the item. I’m glad to see that it’s working out for you and would love to hear about your adventures if you take it full time. Great post. There is money to be made if you’re willing to be creative, resourceful and work hard!